As the Trump administration takes aim at race-based college admissions policies, many of the country’s most competitive schools, including Ivy League universities, are struggling with an equally vexing problem: how to create more economic diversity on their campuses, giving strong students of modest means the same opportunities long available to children from the nation’s wealthiest families. Selective colleges in Massachusetts and across the country have made some progress in expanding their ethnic and racial diversity. But when it comes to admitting and educating students from low-income families, many of these schools have made little headway — or fallen behind. Even some schools that make generous financial aid available have trouble recruiting qualified applicants from among the country’s neediest families. In many cases, such schools aren’t even on those families’ radar. And many poorer students have limited access to SAT prepatory classes, private counselors, and the college-level coursework in high school that can put them on track for admission into a selective university. Advocates for low-income students say these elite schools should aim for at least 20 percent. The underrepresentation of Pell recipients isn’t just an Ivy League problem. Many selective schools, including Tufts University and Northeastern University, let in only a meager number of low-income students. At Tufts, the share of undergraduates who receive Pell aid has been about 11 percent in recent years. At Northeastern, 13 percent of about 13,200 undergrads came from low-income families, according to data compiled by Georgetown University’s Center on Education and the Workforce. That has happened despite the number of high school students seeking undergraduate degrees remaining high and an overall increase in Pell recipients. Recent research from the Equality of Opportunity Project also indicates that some of the most competitive schools in America have enrolled more students from families at the top 1 percent of the income scale than from the entire bottom half of income-earners. In addition, at many selective schools the share of low-income students declined or remained flat between 1999 and 2013, according to tax data culled by the project, a collaboration of several noted economists. Muna Mohamed, a 19-year-old student at Tufts, said she didn’t need to see the data to know about the wealth gap on her campus. In the winter, the school is awash with undergraduates in Canada Goose parkas, which sell for nearly $1,000 apiece, she said, while she has to work two jobs to help pay for expenses not covered in her generous financial aid package. Mohamed, who applied to Tufts on a whim and a desire to leave Maine for a more cosmopolitan experience, said many students from her public high school don’t even have the college on their list. They don’t bother, she said, because they think it’s too expensive, not realizing that the school offers significant financial aid and support to low-income students who get in. Or perhaps they have never touched base with a college recruiter, whose visits may not be well-publicized, she said. “It’s not part of the culture much, so you don’t do it,” Mohamed said. Officials from Tufts and other colleges said they are trying to reach more low-income students.Officials from Tufts and other colleges said they are trying to reach more low-income students. Karen Richardson, dean of undergraduate admissions at Tufts, said the university concluded a $95 million scholarship fund-raising campaign last year that has allowed it to offer a record $21.7 million in need-based grants to the incoming first-year class. Northeastern in the past decade has more than doubled its investment in financial aid. Officials there noted that the school does a better job than many of its peers in helping low-income students climb the economic ladder. Other colleges are also expanding their recruiting efforts, making it easier for low-income students to apply, eliminating merit-based aid in favor of need-based financing, and ensuring that cost isn’t a barrier for families and students who would otherwise qualify. Some elite schools now pay to fly low-income high school students to campus to meet admissions officers. Yale University is among 30 institutions, including all the Ivy League schools, that last December signed on to the American Talent Initiative, which aims to attract, enroll, and graduate an additional 50,000 lower-income students by 2025. 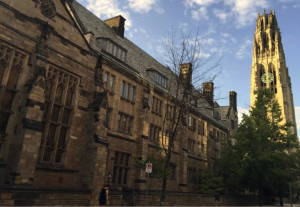 Yale officials said the school has also created more room for low-income students, in part by increasing its undergraduate class size. This fall’s first-year class includes 61 percent more Pell recipients than the class enrolled in 2013, said Karen N. Peart, a spokeswoman for the university. Some rich schools with hefty endowments, including Harvard, allow needy students to attend for free. Since Harvard launched its program in 2003, the number of first-year students who qualify annually has increased by 100, to 320 students annually in a class of about 1,600. Harvard has also increased by 4.7 percent its share of students who come from the bottom 40 percent of income earners between 1999 to 2013, the highest increase among all Ivy League schools, according to data from the Equality of Opportunity Project. At the same time, the percentage of students from low-income families at some of Harvard’s peer universities has decreased or barely budged, according to the data. Schools want to ensure that they admit students who will thrive on their campuses, and those who come from higher-income families, attend rigorous high schools, and have the resources to get academic tutoring are better prepared to match up with highly selective universities, Donahue said. Advocates, such as Kahlenberg, have pushed for a class-based affirmative action that would more directly benefit students who rise above the disadvantages of poverty. But improving access to college for lower-income students can be expensive, requiring that the school provide not only financial aid, but also money for intensive recruiting and more academic and financial help once students arrive on campus, said Katie Fretwell, dean of admissions and financial aid at Amherst College. “It takes a big endowment, and it takes a commitment from on high,” she said. Amherst’s endowment is $2 billion. Amherst College, where last year nearly one in four students received Pell aid, recruits at charter schools — including the Academy of the Pacific Rim, Boston Collegiate Charter School, and Prospect Hill Academy in Greater Boston — and works with nonprofits that help match high-achieving, low-income high-schoolers with scholarships. In addition, Amherst has recently accepted more transfer students from community colleges. About 60 percent of the 100 transfer students that Amherst accepts during a four-year period are from community colleges, Fretwell said. When elite schools do provide access, it can be a life-changing experience for students. Kaelan McCone, 20, a political science and French major from Greensboro, N.C., said he was able to complete an unpaid internship in Spain this summer because of a grant from Amherst. He and his more wealthy classmates have had similar opportunities, McCone said, even though his father works for UPS and his mother is a retired teacher. Still, it’s hard to avoid some differences at a school where the median family income for students is $158,200, McCone said. Some students leave the country frequently, he said, and others eat out at a nice restaurant every week without a second thought. When he was submitting his taxes, a friend asked him why his family’s accountant didn’t take care of the paperwork, said McCone, who worked at a food bar, as a tour guide, and as a Spanish tutor to earn spending money. Some higher education researchers warn that as the US Justice Department targets race-based admissions policies with its investigation into whether Harvard’s practices discriminate against Asian college applicants, turning to socioeconomic factors in admissions isn’t the easy replacement to creating diversity on campus. If only socioeconomic factors are used, schools are likely to lose some of their ethnic diversity, said Rachel Baker, an assistant professor of education policy at the University of California Irvine who has studied the issue. Still, if elite colleges want more lower-income students on their campuses, they have to start paying more attention to income in admissions decisions, Baker said. Right now, there’s little evidence that income is a strong factor in admissions decisions, which could lead to higher education becoming even more segregated by class, she said. Poorer students will remain in community colleges, state schools, and for-profit institutions, where resources and access to business networks are scarce, while the rich graduate from well-funded, selective institutions, Baker said.